Alton Towers – A Great Family Day out! The last time I visited Alton Towers, the cork screw and thunderlooper were still going, in fact the only attraction I recognised this time were Nemesis and the tram that takes you between the car park and the theme park. Growing up in North Wales, Alton Towers was our summer school trip every year and I have really very fond memories of the park so I was super excited to be going back. As soon as we arrived we made a beeline for CBeebies land and made it around inside an hour and a half as it was extremely quiet. We visited on an inset day but I imagine if you visit during the school holidays or at the weekend it would probably take double the amount of time. The Octonauts Rollercoaster Adventure was by far my girl’s favourite ride in CBeebies land! 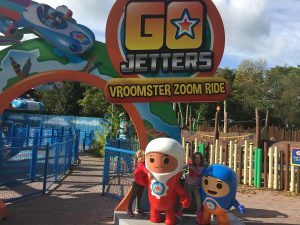 Other attractions they loved were the Go Jetters Vroomster Zoom Ride, Get Set Go Tree Top Adventure and they spent a long time in Nina’s Science Lab so if you’re going on a busy day I would definitely recommend prioritising those. Smaller children would also enjoy Postman Pat Parcel Post and The Numtums Number Go Around. Once we had completed CBeebies Land we explored the rest of the park, visiting the Runaway Mine Train which was the favourite ride of the day. We then went on the Congo River Rapids which we all loved, the Gallopers Carousel, Marauder’s Mayhem (tea cups) and Duel, where we had great fun shooting all the monsters and ghosts! We then took the Cable Car over the beautiful gardens and woodlands of the park over to Cloud Cuckoo Land and headed straight to the Cuckoo Cars where the girls got behind the wheel of the colourful cars and showed us their driving skills. If you have older children there are a large variety of roller coasters and other rides to experience too. There are plenty of restaurants on site to choose from, or like us you can take a picnic and make good use of your time spent standing in the queue. All in all we had a fantastic, fun-filled, exhausting day and we will definitely be returning in the future. If you are a Tesco shopper you can purchase your tickets with club card vouchers which will be sent to you by email – remember to print them off before you go. We visited just for the day but you can make a weekend of it by booking a hotel at the resort or a hotel nearby which might be worth while doing during busier times.